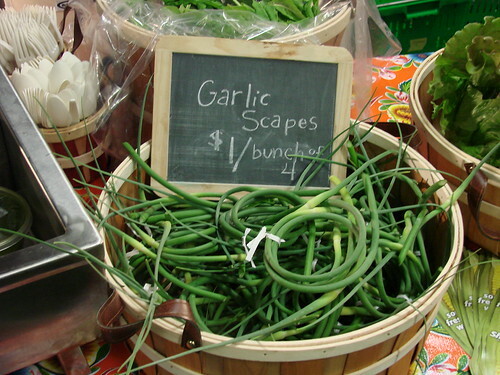 Blondie and Brownie: CSA Haul: What the Heck Should I Do with Garlic Scapes? CSA Haul: What the Heck Should I Do with Garlic Scapes? My mom's Italian so you can be sure my childhood was garlic-infused, but garlic scapes? Never even heard of them until I joined a CSA, and three years later, I still have no idea what to do with them. So enlighten me...what do you do with garlic scapes? For starters, scapes are the young green garlic stalks that get the chop so the garlic bulb can grow nice and big without diverting its energy. Scapes are like garlicky long bean tendril thingys. I love the look of scapes even if I have no idea what I should do with them. If you don't belong to a CSA and haven't spotted them atyour local farmer's market, I can confirm that I did see them at the Union Square Whole Foods this week. If you use scapes, please share any and all suggestions! And on a totally non-scapes related note, HAPPY BIRTHDAY, BLONDIE! Saute them with fava beans, then toss with pasta, good olive oil and parmesan reggiano. Or skip the pasta and just eats the favas and scapes. Delish! Thanks, guys! These are all terrific ideas! My first inclination is to go the pesto route so maybe I'll shake things up and try something totally different like the scapes and favas or grilled scapes (I had no idea you could grill scapes!) Pickled scapes sound great, too. Very excited!